I'm lovebugs, the author of the stories "Abducted by Elemental entities" and "She was seeking help". It's already been a couple of years since I last logged in into this site which made me forgot my password so I made a new account. Anyway let's proceed to my story which happened a year ago just before the reconstruction of our house took place. The incident happened to my sister, Em who's been working in one of the call centers in eastwood. Before our house was renovated, Em usually sleeps at my parent's room together with my mom and her 3 year old daughter. Our house back then was a bungalow type with 3 rooms: my parent's room was the largest next was my room then my aunt's and cousins room being the last. One night at about 6 in the evening While having an early dinner and watching a daily night news, Em suddenly woke up about 2 hours earlier than usual. She went out of the room sweating. At first we were astonished of course because we noticed how pale her face was, she seemed so afraid as if she woke up from a nightmare. Our attention was drawn to her and we forgot about our own meals. We then asked her why. After she told us what happened We looked at each other as if we can't believe that a spirit could really do such a thing. Em was always been a light sleeper. Although she can easily fall asleep, she can also be easily awaken by a very light sound or simply a presence no matter how deep her sleep can be. We were all speechless. My mom who's always been the most religious member of the family wasn't able to say anything, Unable to explain anything about the incident until she finally broke the silence. "Hindi ka kasi nag dadasal bago matulog eh" (translation:"That's because you're not praying before going to sleep.") We just invited her to have an early dinner with us instead of thinking about what happened. Days, weeks past but Em was still complaining about the situation. She said that the same incidents were happening everyday during her sleep. She even exclaimed that things even started to get worst. She's already been experiencing sleep paralysis and nightmares. These had brought her inconvenience due to lack of sleep since she was working at night. So I let her borrow one of rosaries. I then saw her wrapped the rosary around her fingers, pray and started to fall asleep. She did this every night until We finally didn't hear any complains from her anymore. One afternoon, three months after Em's encounter. My mom, Em, Emilly, My daughter and I were playing in the room. Telling stories and stuff. I decided to take a photo of My mom holding my 6 months old daughter in my parent's room and uploaded them on facebook. Several weeks after. It was already 2am and I was still wide awake. Trying to get the boredom out of me. I browse some photos I recently uploaded on facebook however, When I saw the My mom's photo together with my baby. Something made me stare at it for about three minutes and I didn't bother to get some sleep for the rest of the night. In the picture, you could see some sort of a shadow-like small hand holding or pulling my sister's finger and a blurred head of a boy on the side. What makes the image creepier is that the hand seems to have only three fingers. I showed this photo to my sister wondering if it has anything to do with my sister's unexplained experiences during her sleep. My sister started to panic, she screamed and ran towards my mom. Mom claimed that it was her hand holding my sister in the photo so my sister would stop panicking, however it was obviously impossible for her to hold my sister even to lay a finger on her because as you can see She's holding my daughter with both hands. I shared this photo so you could have a closer look and maybe you could help me find out what it is. And please DO NOT share or upload this photo in any networking sites such as facebook and twitter. The following comments are submitted by users of this site and are not official positions by yourghoststories.com. Please read our guidelines and the previous posts before posting. The author, lovebugs16, has the following expectation about your feedback: I will read the comments and participate in the discussion. Hi! Thanks for reading my story. LADY-GLOW: yes! Yes, my sister-in-law had a miscarriage when I was like 8-9 years old or younger. I remember it was also a boy. I saw him when I was 11, I was having my late dinner and I saw him in our mirror's reflection. I know It was him because he looks like my nephew (which is his brother). So i'm pretty sure he doesn't look like the one in this photo. Wow! Yes I see the hand, and yes, I may have the same opinion as lady-glow. 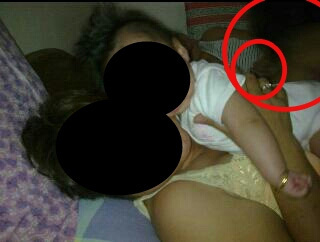 The spirit or whatever the hand is, it's not harmful, it's just trying to play with the baby, sort of. If it's a spirit well it seems young (or small) and it may not have enough energy to do any physical or psychological harm. If it bothers you in anyway please try any cleansing methods that you know of. Cheers! Love hugs: WOW, that picture is very interesting! Yes, I see what seems to be the face of a little boy and a hand trying to reach to the baby or your mother's hand. Has a little boy or girl passed away in your family? Perhaps a miscarriage or a stillborn baby? It doesn't have to be recently, - do you know if your mother lost a child? It seems to me like the kid was only looking to get some attention and perhaps got attracted by the presence of your little daughter in the house. I assume that the prayers helped him to move on or, at least, to understand that his attempts to communication were not welcome by your sister. I would suggest for your family to pray together with the intention of sending this spirit to the light. Personally, I don't think the spirit means any harm and there's no need for freaking out. © The ghost story The Three Fingered Entity is copyrighted to lovebugs16. Edited by yourghoststories.com.